← How’d he do dat???? 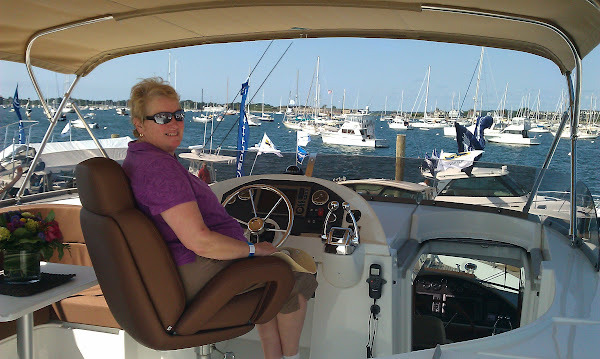 Every year we go to the in-water Newport Boat Show in Rhode Island and this year we were not going to let our massive home improvement efforts stop us! When we arrived at the show, Rob commented that this was the first year in many seasons that we didn’t visit Newport in our boat at all. Boo hoo! In fact for several years, we’ve gone to the boat show in our boat Quantum Leap, picking up a mooring in the main harbor and staying for a week. But not this year! Quantum Leap never left the dock all summer. For those of you who have never been to Newport, RI, it definitely should be on your bucket list. There is so much to do! 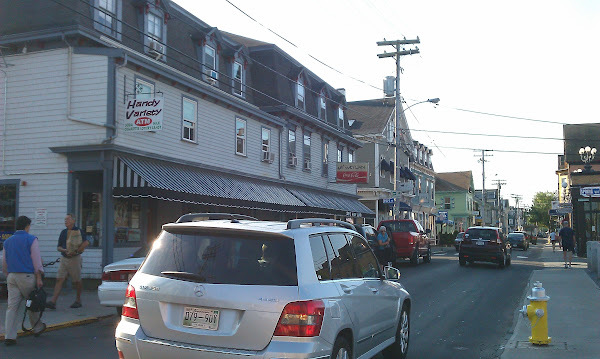 Unique shops to browse, the waterfront to explore, numerous boat tours, visit historic Ft. Adams (lots of naval war history in the area), tour one of the many mansions that were the summer cottages of the Vanderbilts and the Astors, etc. These are just a few of the activities available. And if you can come by boat that is the best experience of all. To be in the company of mega millions worth of megayachts (100′ and up) is a humbling but nevertheless enjoyable experience in a beautiful and unique deep water harbor. 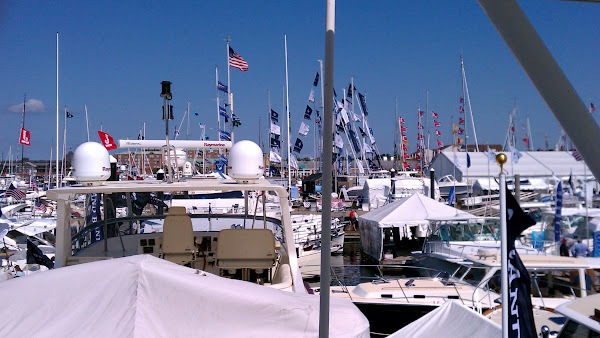 Anyway, the show was held from Thursday, September 13th to Sunday, September 16th and featured both sail and power boats in the water that you can board, as well as products and services from thousands of exhibitors set up in several tents. It takes the Newport Yachting Center several days of re-arranging docks to prepare for the show (always fun to watch when we come by boat). Since Thursday is designated as VIP day and tends to be less crowded than any of the other days, we decided to attend on that day. It was a good choice because it was a beautiful day – bright blue sky, sunny with a slight breeze and in the low 70’s. Absolutely perfect! Every year, our friend Chris, has been able to get us free tickets and this year was no exception (thanks again Chris!). Parking at the show is always a challenge although you can park at one of the nearby beaches and take a shuttle into town which we’ve done in the past. Instead, we decided to arrive in Newport early so we could catch a space at the public parking lot near the Visitor Center. When we arrived shortly after 8 a.m., there were plenty of spots still available in the lot. From there it was a 10 minute walk to Gary’s Handy Lunch on Thames Street where we had breakfast. 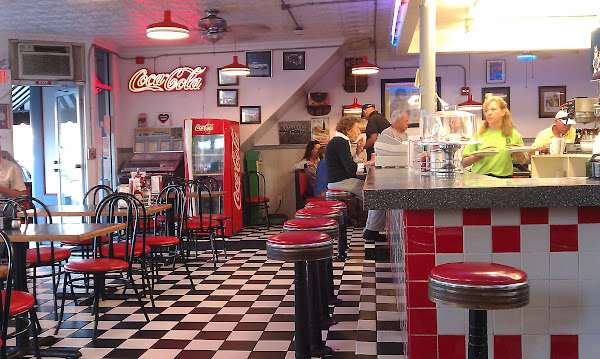 Although Newport has lots of restaurants, the majority of the places that serve breakfast are expensive with (in our opinion) only mediocre food at best. Handy Lunch is a local hangout and a bit less pricey but nothing special. 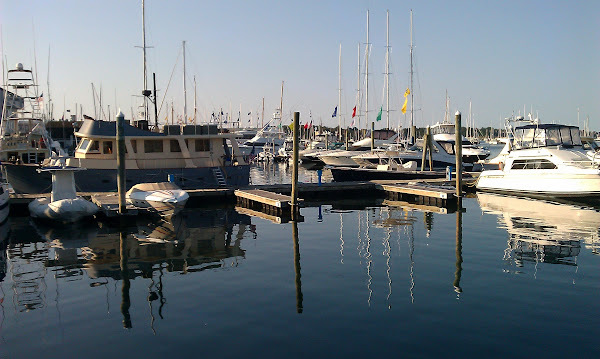 Once we finished breakfast, we started to walk back to the waterfront and Newport Yachting Center where the show is held. It was only a little after 9 a.m. so we had some time to kill before the 10 a.m. operning. Luckily we ran into our friends, Chris and Bob (who got us the tickets) so we walked along with them towards the show. 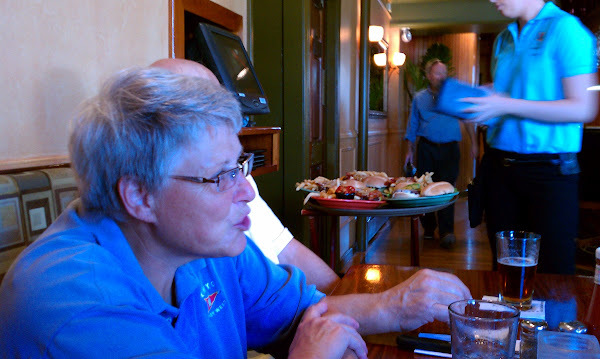 We made plans to meet them as well as our other friends, Linda and Bill at the Red Parrot restaurant for lunch at 1:00 p.m. Rob had taken his sweatshirt thinking it was going to stay chilly but during breakfast he decided he didn’t want to wear it or carry it around all day so he walked back to the parking lot and left it in the car. Wanting to save my feet from a lot of extra walking, I waited for him on one of the park benches overlooking the harbor. Finally we were ready to go to the show. Normally we peruse all the goodies in the tents first and then board the boats, but this year we decided it would be less crowded if we did the boats first, so we beelined it to the docks where the trawlers were located. Ah, yes, this is where we start to drool, wishing we were independently wealthy! But unfortunately we’re not, so all we can do is dream. We boarded a variety of trawlers (which would be our preferred vessel type if we ever replace Quantum Leap) – a 34′ American Tug, a 34′ and a 52′ Beneteau “Swift Trawler”. 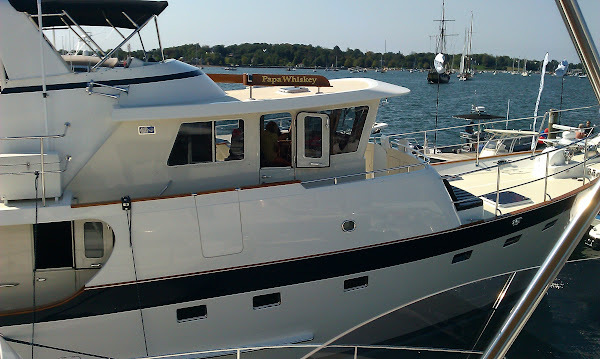 I think the Beneteau 52′ had been marked down from $1.3 million to $999,999 – such a deal! I immediately whipped out my pen and wrote a check – LOL. 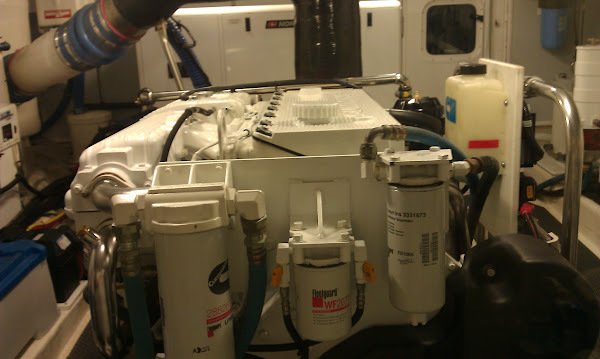 The picture on the right is a Kadey-Krogen 58′ which we didn’t board figuring it was just too big for us. After we sell the house, we might consider the possibility of upgrading our boat to a slightly newer, slightly bigger one so it’s always fun looking at the different layouts. On our list of criteria are two staterooms, two heads, a decent galley (with an oven), diesel engines and a stand-up (or close to it) engine room for Rob. Speaking of our criteria, here’s a weird coincidence. The day before the show Rob received his weekly email from Yachtworld with a list of boats that potentially match our criteria. There were several nice ones, but one stood out and seemed to have the accommodation and equipment that we might be interested in as a liveaboard. And the price seemed down to earth for this size vessel. 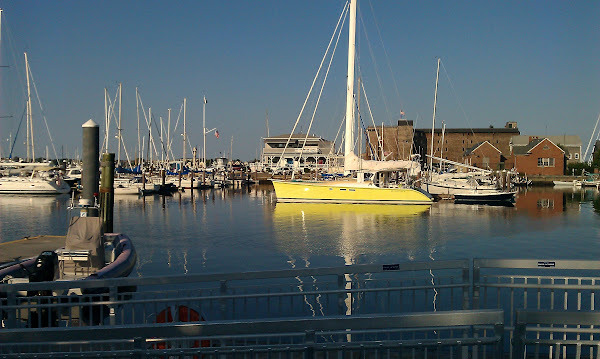 The name of this boat was “Plane to Sea” (ex pilot I guess) and is located in CT.
Over breakfast at Gary’s, he showed me photos of the boat – we even commented that since it was in CT and so close it might be worth a look even though we are not ready to buy yet. Anyway, we’re hanging out on the bow of the 52′ Beneteau enjoying the beautiful weather and talking with the broker, when this man and his wife stroll aboard. He had on a polo shirt with a boat name embroidered – can you guess what the name was? Yep, Plane to Sea! I asked him if he had a boat for sale and sure enough it was the one we were looking at online that morning – is that weird or what? Is it a sign from the cosmos? Like, what are the chances? After exploring the boats, we headed towards one of the tents which is where we ran into our friends, Linda and Bill. We spent some time perusing the vendor booths with them until it was getting close to 1 p.m. and we were hungry so we headed over to the Red Parrot for lunch and to meet Chris and Bob. Luckily it wasn’t crowded so we were seated right away. 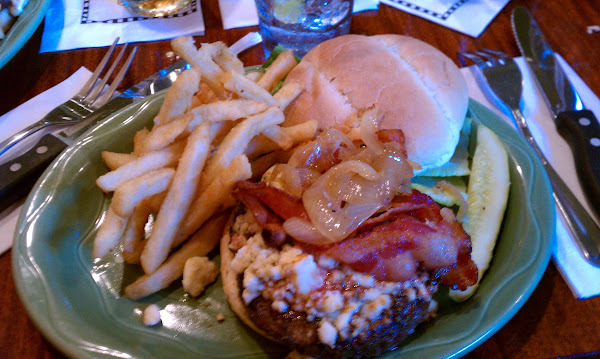 We all ended up getting burgers (ours were bacon and blue cheese) which were very good. It was good to sit and relax for awhile. And it is always a fun time with this crew! After lunch, we said goodbye to Chris and Bob who were heading home. This would be our last visit with them since they are leaving for their place in FL on the 29th – we’ll miss them but hopefully we’ll have an opportunity to stop by to visit them there during our winter stay. We headed back over to the show with Linda and Bill so we could finish walking through the tents. Our only purchase this year was a screw extractor kit – Rob had purchased one several years ago but one of the bits had broken so he wanted to get another one as this comes in very handy to remove those pesky stripped out Phillips head screws which are a common problem on the boat (18-8 stainless is fairly soft). He was told by the salesperson to send the broken one back to the company and they will replace it, so now he’ll have one kit for the boat and one for the bus. Finally around 3 pm, we decided it was time to head home. What a wonderful day – it was so nice being out of home improvement mode for a day. Tomorrow we start painting! More on that in another post. Sounds like a great day! 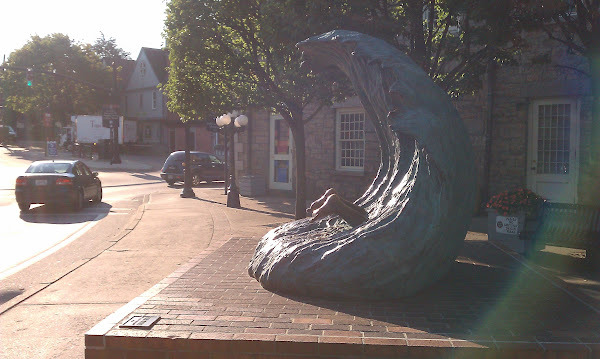 I do miss Newport!